Mehndi Decoration Inspo - A Mehndi Ceremony held in the Garden of a Housing Society! We hear of venue names big and fancy, with a status so great we're sold right there. But what if we told you, you don't need a fancy venue to make your wedding celebrations grand?! Real Bride Shruti proved to us that all you need to make your wedding pretty is a great vision and approximately 118363 flowers. 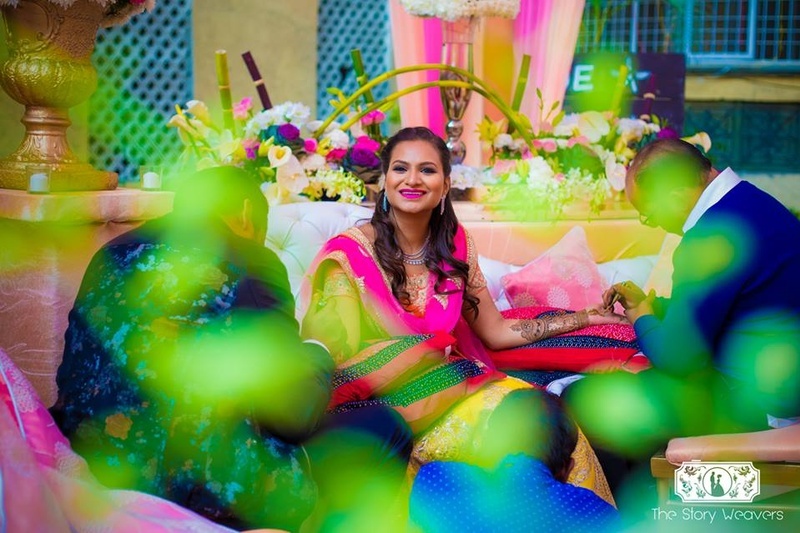 Shruti and Shashank decided to set a different kinda trend and have an extravagant mehndi inside of a housing society in the garden area of Antriksh Society sec-50, Noida. Full of fresh flowers and drapes in tones of pink and peach this mehndi ceremony was a breath of fresh air from all the classic yellow marigold laden ones we've seen! How stunningly intricate is this bridal mehndi?! Cute signage ideas for your mehndi ceremony! These definitely made our heart go aww! Coral, pink and orange drapes can do magic to any setting! PS - Don't miss the Wine-Dine-Dancing-Kisses board! Pink and White coordination done right! We love how this stunning bride paired an orange choli with a pink dupatta and contrasting yellow gota work lehenga for her mehndi ceremony! There's no such thing as too many flowers, we believe! One for the mehndi craziness! One for the prettiness through the plants! What is an Indian mehndi ceremony without a flower laden cycle afterall?! We are completely feeling this chic white bicycle adorned with fresh flowers! The mirrored surface with the candles only ups the game! So what do you think?! Would opt for a mehndi in the garden of your housing society?